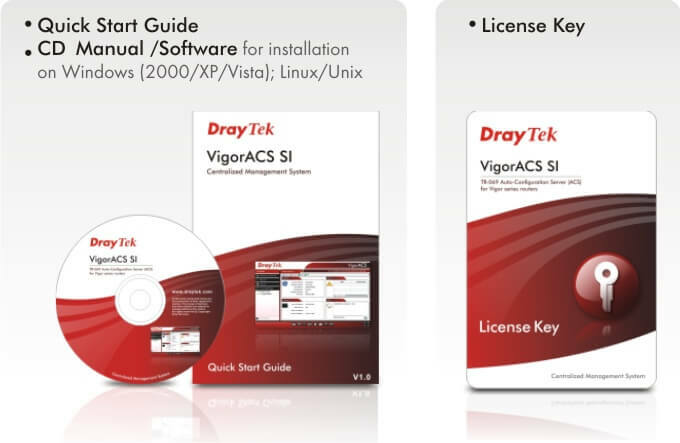 For each Vigor device purchased, DrayTek provides a FREE 30-day trial version of VigorACS SI client software. 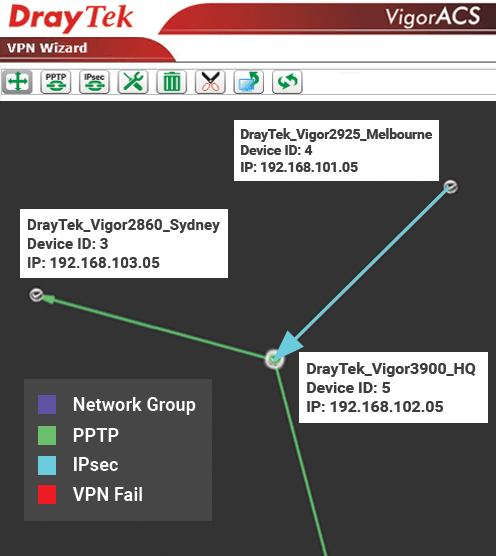 You can consult a dealer near you from: http://www.draytek.com.au/where-to-buy/ for a free trial of VigorACS SI. You can also contact our technical support at support@draytek.com.au or call us at +61 2 9838 8899 for any technical issues regarding DrayTek products. 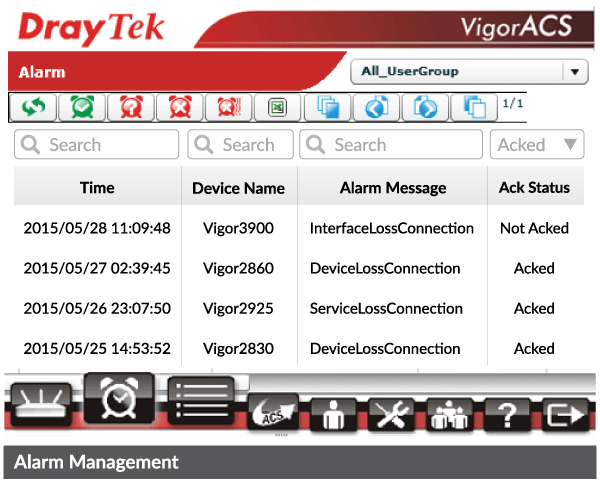 VigorACS SI is a TR-069 based centralized management system for DrayTek’s Vigor devices. With a user friendly interface, it allows system integrators or network administrators to configure, monitor and manage DrayTek devices remotely from the comfort of their offices or homes. There are many benefits that the VigorACS SI can offer, two of these are time savings in VPN setting and in firmware upgrades. Below are 2 tables outlining time and cost savings for VPN setting and firmware upgrade in scenarios: one medium network with 20 nodes and one large network with 500 nodes. VigorACS SI can be purchased by businesses or organisations with self-hosted servers, for licenses of 50 nodes (ie CPEs) each up to 5,000 nodes each. IT service providers or system integrators can setup self-hosted or cloud based Automatic Configuration Servers (ACS) for their own customers. For example, for a license of 50 nodes, you can serve up to 50 customers with 1 node each, or 5 customers with 10 nodes each. 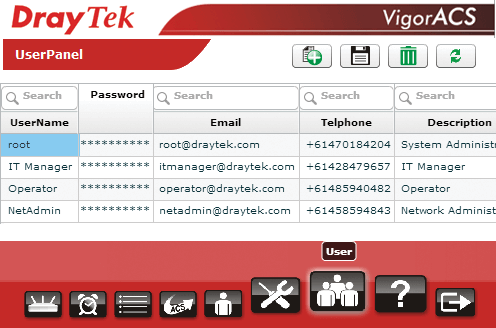 For each Vigor device purchased, DrayTek provides a free 30-day trial version of VigorACS SI client software. Consult our sales team for more details. VigorACS SI allows CPEs, when installed in remote networks, to receive pre-configured data such as IP, PPPoE, VoIP parameters, etc. from the ACS server. VigorACS SI allows network administrators to schedule provisioning of new profiles, firmware upgrades or backup/restore configurations for selected CPE’s to occur at specific times. Operations such as configuring VPN connections, VoIP settings, uploading new profiles, etc. can be scheduled to take place at the same time and in the same way as required. Auto Provision will reduce the cost of on-site support and ensure network uniformity. For example, in a project for a national lottery organisation, several thousand Vigor routers were preconfigured with the same network, VPN and VoIP settings as well as firmware versions. VigorACS SI includes a number of wizards which allow network administrators to quickly and easily carry out complex tasks. The Configuration wizard provides a convenient user interface for setting up backup and restore functions. You can select CPEs or groups and schedule them for backup or restore to occur separately or simultaneously. The VPN wizard is designed to simplify configuration of VPN tunnels between CPEs. With the CPEs shown on a Google Map page, you can drag the icon of one CPE and drop it onto another to create a VPN tunnel between the two CPEs within seconds. The Firmware wizard allows firmware upgrades to be carried out at the scheduled date and time, or immediately. VigorACS SI records real time alarms and sends alert messages about fault conditions of all CPEs to specified phone or email accounts. The types of alarm reports include date, time, alarm type, level and acknowledge status. You can examine the alarm details and system logs to determine the nature of the faults, and hopefully clear them without leaving your place and racing to the sites. A Log View page displays two types of information: Device Action and System status. The Device Action page lists network activity data of the CPEs such as download, reboot, parameters, objects added or deleted by VigorACS SI, etc. With these records, you can check what had happened to each CPE and when. The System page displays the changes made to the CPEs by the VigorACS SI including network names, CPEs’ names, CPEs’ locations, etc. The Network Topology view provides a Google Map view showing the locations of the CPE devices. The User Operation Management page lists three authority levels for network administrators (high to low): system administrator (user name “root”), administrator (user name “admin”) and operator (user name “operator”). Users are provided with access privileges based on their authority levels. For instance, an IT department head as the VigorACS SI license host can have the highest authority as a system administrator. A senior IT engineer or an ACS SI license reseller can have the secondary authority as an administrator. A junior IT personnel can have an operator level access authority. 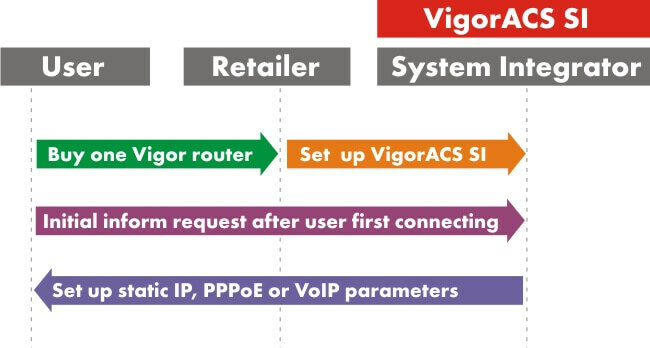 Auto provisioning function of VigorACS SI version can satisfy management needs of System Integrators with obtained license from Telco/ISP (figure 1) or only providing value added support (figure 2) to end-users who purchase Vigor routers. Furthermore, VigorACS SI will be capable of any management work of all CPEs spreading in worldwide branch offices from a multinational company such as Figure 3. CPE here defines as Vigor routers at customer’s site. The following figure shows an overview of the application between VigorACS and CPE devices. 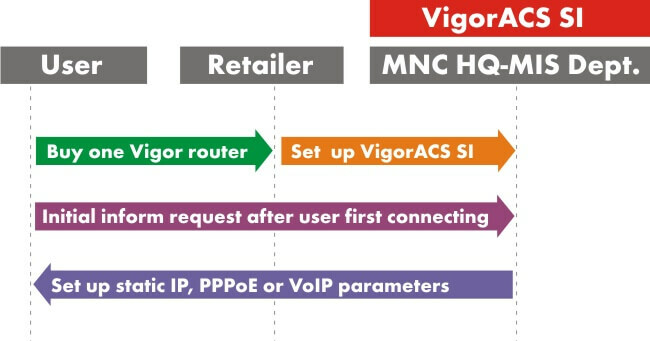 With TR-069 protocol, VigorACS SI can easily communicate and manage devices. 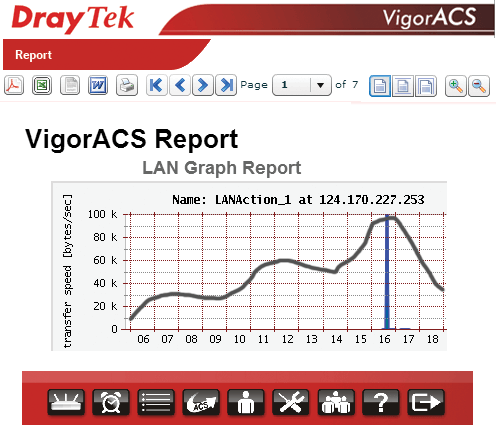 Please contact support@draytek.com.aufor more information about the VigorACS SI download.